The film opens with the death of Nikki, a young woman that recently downloaded Mr. Bedevil, a mysterious Siri-like A.I. app. She's stalked by a paranormal presence and is later found dead from a shock-induced heart attack. 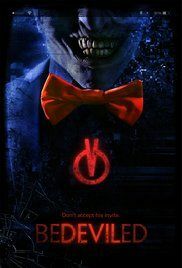 Following her funeral, Nikki's boyfriend, Cody, and best friend, Alice, along with Alice's boyfriend, Gavin, and friends, Haley and Dan, all receive invites to download Mr. Bedevil. They decide to download the app, which results in the group getting tormented by Mr. Bedevil and becoming haunted according to their personal fears. They also discover brands on their bodies in the shape of Mr. Bedevil’s app icon and eventually accept that the app is intent on killing them. Trying to destroy their phones will not stop Mr. Bedevil, as their phones will only get restored to their prior state. Read more on Wikipedia.